The Daintree is a very unique rainforest experience, and to gain the most out of your visit we recommend a stay of at least 3 nights to truly appreciate this region. 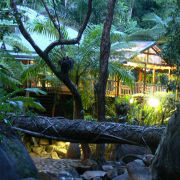 The Daintree Rainforest is a great place to relax and unwind, and what better way to enjoy the rainforest experience than in your own unique holiday home. 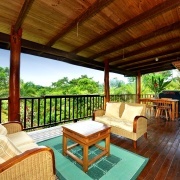 Each holiday house has is very special with its own unique features, whether situated by the beach, next to a private waterfall or high up in the hills overlooking the vastness of the Daintree Coast, the experience and beauty will blow you away. For those who prefer the comforts of home, then a self contained holiday house is the ideal option. 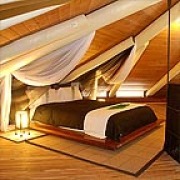 Perfect for families and couples, you can experience your own piece of rainforest paradise, in peace and tranquillity. The Daintree Coast is the largest renewable energy community in Australia. With no grid-connected electrical power north of the Daintree River, households and holiday accommodation must generate their own electricity. Many properties rely on a variety of hybrid-systems to draw from renewable energy sources, such as hydro and solar-power that is stored in large battery banks. With a high level of rainfall and humidity combined with the necessity of self sufficient power, good building design is a must. 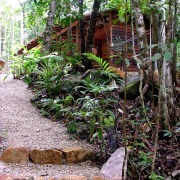 Many holiday homes have been designed to blend into the rainforest and have the least impact on the surrounding environment. Extensive use of timber reduces energy needs, consumes less resources and minimises environmental impacts. 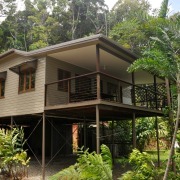 To reduce the ecological footprint further, comfortable living in the Daintree relies on making use of natural air flow and light; adjustable louvre windows capture the cooling rainforest breezes, high ceilings and air vents allow heat to rise and escape, and a raised floor construction lessens the impact on wildlife. Wide verandahs extend the living space to allow for 'open living' all year round, meanwhile insect protection ensures local critters are kept out, for a more relaxed stay! Most Daintree holiday accommodation implements a myriad of energy-saving features into their system, to allow for the creature comforts you would usually expect of accommodation closer to 'civilisation'. 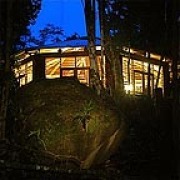 For example, Daintree Cascades Cottage & Roundhouse generates its electricity from the private creek & waterfall which passes directly by the retreat. Daintree Magic and Daintree Seascapes at Cow Bay operate solar panels to power the fans, overhead and bedside lights, TV and DVD. The refrigerator, stove and hot water are run on LPG gas, and the water supply is from rain water collection tanks. These luxury timber holiday homes are elevated to maximise the prevailing sea breeze and sweeping views. Daintree Views has a combination of solar, battery and generator power. There is no airconditioning, however the property has been designed to capture the natural air-conditioning from high on the mountain. Wait a While in the Daintree is a stunning pole framed timber house, and is one of the largest single dwellings ever constructed in the Daintree Rainforest. Completed in 1993 and modelled on a traditional New Guinean long-house, Wait-a-While Daintree provides almost 500 square metres of living space and includes a swimming pool, billiard table and a huge outdoor entertaining area. 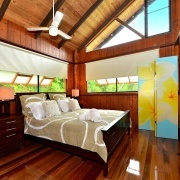 Cape Tribulation Sanctuary is built on one of the highest landmarks in Cape Tribulation. This luxury executive Three bedroom tropical house has been especially designed for the tropics by award winning architect Chris Van Dyke. Set on 26 hectares of world heritage rainforest you can explore the rainforest without leaving the property as The Sanctuary has private hiking trails, swimming holes and secluded mountain streams flowing through the property. This property has been visited by many Australian Hollywood stars who describe the peace, serenity and the outstanding location “unbeatable”. 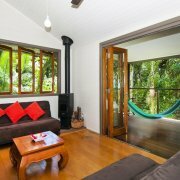 Daintree Secrets is set amongst three acres of luxurious rainforest and features its own secluded creek and swimming hole. The deep crystal clear waters of Little Cooper Creek, flows right in front of the verandah! 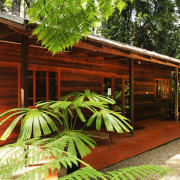 Daintree Views is a 3 bedroom self-contained holiday house surrounded by 20 acres of World Heritage Rainforest. Privately owned and architecturally designed to capture the natural air-conditioning from high on the mountain, you can relax on the verandah or in your own private outdoor spa and enjoy breathtaking views across the Daintree valley. 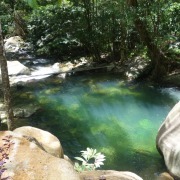 Take in the rainforest on one of the walking tracks or swim in your own private mountain swimming hole located on the property. If you don't feel like self catering then there are a number of restaurants in the Daintree area that offer intimate and personal dining experiences. Beautiful rainforest dining includes Cycad Restaurant at the Daintree Wilderness Lodge, On The Turps Bar & Restaurant at the Daintree Heritage Lodge and Whet Restaurant in Cape Tribulation. For a quick bite try Thornton Beach Cafe, Boris's Bar, Cafe & Restaurant at Lync Haven, Mason's Cafe or the Boardwalk Cafe in Cape Tribulation. Prior to the Daintree River you will find a number of eateries around the Daintree Village area, and fine dining at the Daintree Eco Lodge and Silky Oaks Lodge.